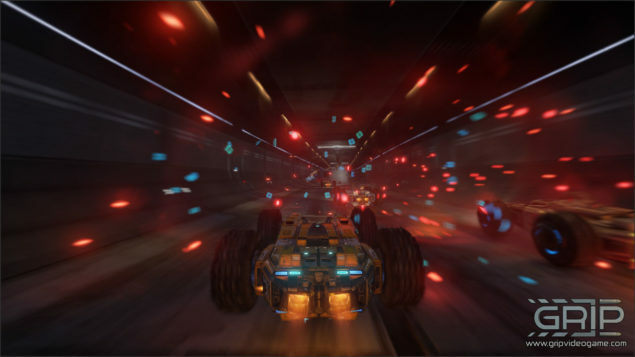 We have reported a few times already on GRIP, the Unreal Engine 4 powered combat racer currently on a Kickstarter campaign for funding. The game, a spiritual successor to Rollcage, is being produced by indie studio Caged Element; we reached out to them in order to bring you some fresh information on this exciting project. Today, we’re offering you a small preview of our interview. Many gamers have questioned the team’s initial choice of platforms (PC and PlayStation 4), so we inquired on the matter and got a pretty definitive answer: GRIP is coming to Xbox One as well, even if a bit later. We can only budget for one console for initial release and we felt that Playstation was the best fit since Rollcage’s heritage is firmly in the Playstation camp. However, we have every intention of releasing for Xbox One and other platforms a few months after launch. We would love to be able to offer crossplay between all formats. However, there are a number of technical hurdles needed to overcome before we can say for certain. Crossplay between all formats? Sounds like they have heard my cry from a couple of days ago! Hopefully they can pull it off. Moving on, they have clarified how important the 60FPS target is for the console versions of GRIP. We’re aiming to deliver a fast paced, adrenaline fuelled combat racer… anything less that 60fps would be daft. Yes, that is absolutely our goal. We’ll be exploiting anything and everything to make this the fastest, most beautiful looking combat racer ever made. Come back tomorrow to read the full chat we had with Caged Element. GRIP Hands-On Preview – Has Rollcage Returned?